Premier Wynne has serious concerns about the new Comprehensive and Progressive Agreement for Trans-Pacific Partnership. 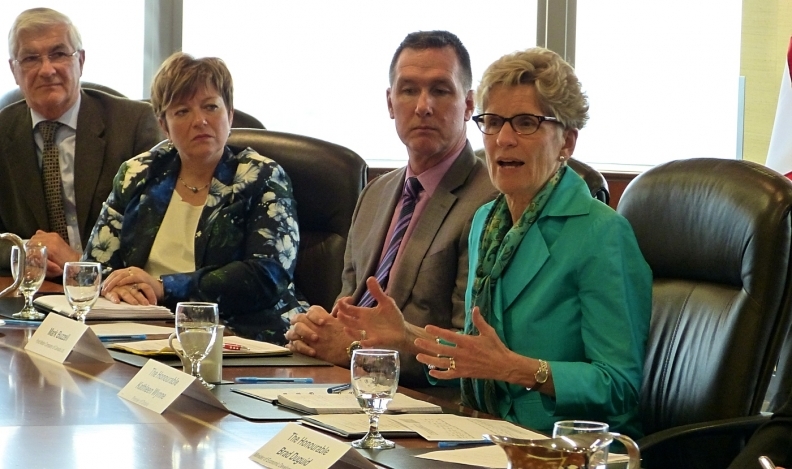 Ontario Premier Kathleen Wynne thinks the newly agreed-to Trans-Pacifica Partnership is so bad for her province’s auto industry she’s calling on the federal government to give the sector $1.26 billion over the next 10 years to offset any losses. Wynne made her demand while speaking at the Toronto Region Board of Trade on Thursday. She harkened back to a 2015 promise she says was made by former Conservative Prime Minister Stephen Harper, one of the architects of the original TPP, which at that time included the United States. Wynne said Harper’s government calculated the TPP would reduce auto investment by two per cent. So, the Conservative Government of Canada said in 2015 that it would provide transitional assistance to the auto industry through the Automotive Innovation Fund (AIF), which no longer exists under Primer Minister Justin Trudeau’s Liberal government. And the new TPP the governing federal Liberals agreed to now excludes the United States. The AIF was rolled into the Strategic Innovation Fund, managed by the Ministry of Innovation, Science and Economic Development. The ministry didn’t immediately respond to a media request placed by Automotive News Canada. “That was the plan in 2015, and it needs to still be the plan in 2018,” Wynne said of the transitional assistance. She believes it’s needed more now than it was three years ago. Flavio Volpe, the head of the Automotive Parts Manufacturers’ Association, called Wynne's speech "an important acknowledgement that the CPTPP’s automotive content levels will negatively affect the value proposition of the sector’s Ontario-based manufacturing." "Transitional funding that helps rebalance significant negotiating concessions could begin to address real concerns for thousands of people employed in the sector," Volpe said. Neither Volpe, Wynne or a spokeswoman for the premier’s office would say exactly how $1.26 billion would be used within the auto industry. Volpe and others are especially concerned about lower rules of origin for automobiles and their parts. The CPTPP mandates 45 per cent of a fully assembled vehicle originate within the 11 countries in the agreement in order to be considered duty-free. The requirement for parts is 35 per cent. That’s markedly less than what’s currently required under the North American Free Trade Agreement, in which the percentages are 62.5 and 50 per cent, respectively. Volpe is worried cheaper parts made in Asia will flood the Canadian auto sector. Meanwhile, the federal Liberal government doesn’t seem to agree with their Conservative predecessors, who drew up and analyzed the original deal. Trudeau’s government’s analysis of the new deal says, "production in the automotive sector is expected to rise very modestly, by $206 million." The analysis also concludes: "The impacts on the automotive sector are slight, with a small increase in output and exports." American imports into Canada could also fall by $3.3 billion under the recently rebooted deal, the federal government has concluded. Volpe previously dismissed those predicted gains as insignificant. He said the gain would amount to only $171 million by 2040. "Contextually, the Canadian auto sector ships about $85 billion in goods annually,” he said earlier this month. “This 22-year increase represents approximately 0.2 per cent on that number, and when one accounts for inflationary dynamics, this represents a serious decline in real dollars." Not everyone is against the new CPTPP. Linamar, the Japan Automobile Manufacturers Association, and Global Automakers of Canada all approve of the deal. JAMA, for example, says the Japan-based manufacturers it represents export more than four times as many vehicles from Canada as they import from Japan.